WordPress is truly the most popular open source content management system in the world. You can easily publish, manage, control, edit and delete content on a website with a few mouse clicks. One of the little drawbacks however remains with designing a website as WordPress was never meant to be a designing platform. This can be easily overcome by creating a wordpress theme for your website. First create a psd for your design and then convert it into wordpress cms. Know What You Want - Analyze your PSD file before you start with the process of PSD to WordPress conversion. Assess the complications that you are likely to comprehend during the process. You need to plan the slicing of the PSD file, splitting of HTML, adding CSS codes, headers, footers and images. This tip might sound mundane but a detailed plan will save your valuable time in the final process. 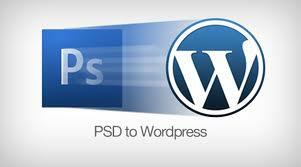 Slice The PSD File - This is the most crucial step in PSD to WordPress conversion. Open the PSD file that you need to slice in Photoshop or any other compatible software. Slice each and every part carefully putting them into separate layers. Once the slicing is over carefully convert all the sliced components into bitmap, JPEG or GIF images. These images cannot be directly uploaded, so you need to code them in html and css to add functionality. Convert PSD To HTML – In the next step convert your PSD to HTML as this is the soul of web development. While converting a PSD to HTML template you will need to create wrapper div, header div and comment div for a dynamic WordPress site. Apart from this you should also break the body, logo, website name and main image into own divs. When you convert to HTML you will get a clear picture of the navigation of your website. Structure The File – Next you need to work on the website structure and here you must create individual files such as index.html (HTML codes), style.css (CSS styling codes), index.php (PHP codes). Once this process is over you should convert the static webpage into a dynamic WordPress theme by integrating all these elements. Test The WordPress Theme – Last but not the least, testing is one of the most crucial steps in PSD to WordPress theme conversion. Once you have customized the WordPress template as per your requirements, you should test the website thoroughly on all the popular browsers such as Internet Explorer, Firefox, Chrome, Safari, and Opera in order to check its stability. A part from this there are many software and applications which help you in converting PSD to CSS/WordPress but many of them don’t deliver results as promised and those which do are highly expensive. The best option is to hire the services of expert WordPress developers as they work on these projects day-in day-out and thus offer you high quality websites at minimal cost. Remember a website is your brand extension and you should never compromise with its quality.